Here, you can download a free sample of 120 questions OMR sheet provided by OMR Home. Providing all the necessary features, this free sample is a helpful tool for educational institutions to take the test of their candidates. 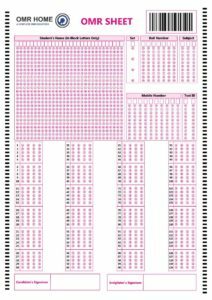 Need an OMR sheet for 120 questions, just a simple download and you can have as many printouts as you want. OMR Home comes with Verificare OMR Software that is expert in designing OMR sheet of your choice. This sample has got OMR enabled informative fields to be filled like name, roll number, mobile number and the test subject. The questions are divided into 6 rows with 20 questions in each row. Every row has got 5 sets and 4 options named A,B,C,D. The students are instructed to fill every relevant bubble completely and make sure that the mark does not spread to the adjacent bubble. Previous Post:Which is the best scanner that can be used with OMR Software? Next Post:How does an OMR Software work?